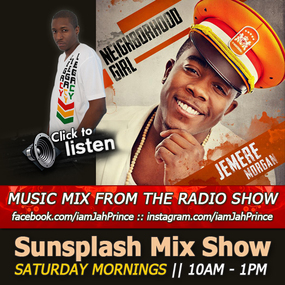 This Sunsplash Mix Show episode features a new dubplate track from Jemere Morgan and singles from Busy Signal, Protoje Pressure and much more. Click below to LISTEN to another exciting Reggae / Dancehall morning mix show. Jah Prince spins monthly (2nd Saturdays), Caribbean, African and American music at the Vibes Night Clubin Decatur, GA and every (1st Wednesday), at the HOBI POWERSHOOT & Industry Mixer held at the House of Blended Ink Studios & Gallery in the Castleberry Art District of downtown Atlanta (431 Fair Street).